In our home, it is Belle who designated herself as the Breakfast Queen. Rather, Breakfast Princess. She's the one whipping up pancakes, waffles and loves to make crepes. And like all cooks, really loves to see her siblings lining up behind her, patiently waiting to be called when the next crepe is done. 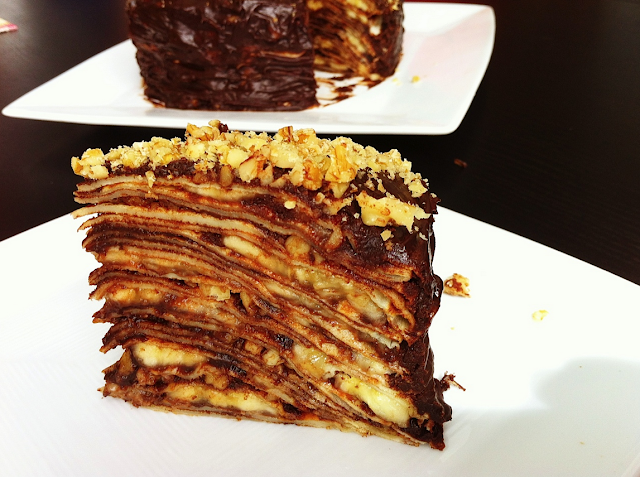 Belle has been wanting to make this layered 'cake' for some time but usually has to fight to keep her crepes untouched. This time, she was successful. Maybe because the siblings weren't around to be tempted with the delightful aroma of her crepes coming out of the pan. So today, she collected enough of them to pile up into her crepe cake. This recipe is adapted from one from the Smitten Kitchen cookbook. Deb has amazing recipes that just work! Thank you, Deb! We put some more oomph to it by adding sliced bananas between the layers. It made for an extremely delectable and amazing dessert with layers of flavour. The soft crepes with the bananas ... yum! Then there was that silky hazelnut cream and the rich chocolate ganache. Everything came together with the crunch of the hazelnuts. It was a feast for the palate! 1. Melt the butter in a small saucepan over medium heat, then reduce the heat. 2. Stir regularly and scrape anything that sticks to the bottom. 3. When the butter smells nutty and is brown, pour it into a bowl and set aside to cool. 4. In a bowl, add 6 tbsp of the butter, milk, eggs, flour, salt, and sugar and whisk until combined. 5. Cover with plastic wrap and chill in the refrigerator for one hour. 6. Preheat the oven to 350ºF and bake the hazelnuts on a baking sheet. 7. Toast for 5 minutes, roll, and toast for another 5 minutes. 8. Take the baking sheet out of the oven and place on a tea towel. 9. Remove the skins from the hazelnuts by rubbing them together (whilst in the towel) after they've cooled enough to hold. 10. Grind 1 cup of the hazelnuts in a food processor with the confectioners' sugar, Frangelico, and salt until small clumps form, taking care to not over process, lest it turn into a nut butter. 11. Place this mixture in a saucepan with milk and sugar over medium-high heat. Simmer while stirring frequently. 12. Whisk yolks with cornstarch in a bowl until smooth. Slowly add the milk mixture from the saucepan into the yolk, whisking regularly. A spoonful at a time, so the eggs do not cook. 13. After about half a cup has been whisked in, reverse the process. Now slowly stir the warmed egg yolk into the saucepan, whisking regularly until they combine and start to boil. 14. Cook for 2 minutes. The mixture should start to get thicker. 15. Remove from heat. Stir in the rest of the browned butter. 16. Place the mixture in a bowl and press a plastic wrap on top. 17. Refrigerate for a couple hours until it has set. 18. Put a pan on medium-high heat, and butter it. 19. Add 1/4 cup of batter and tilt the pan around so that it coats the the bottom of the pan evenly. 20. When the bottom of the crepe is golden brown and the top of the crepe has set, flip and cook on the either side. 21. When it's cooked, place on a plate with paper-towel covering it so that they will not stick to each other. 22. Slice the bananas as thin as you can. 23. On a cake stand, lay a crepe and spread pastry cream and place a few banana slices. 24. 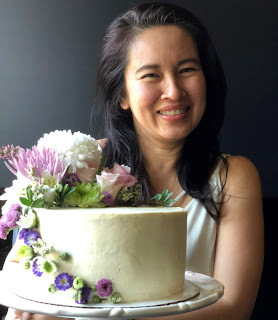 You don't have to place bananas on all layers, just every third or so, making sure you are filling up the 'hollow' spaces, so the cake rises up evenly. 25. Repeat until all layers are in place. 26. Rest this in the refrigerator. 27. Add chocolate to a bowl. 28. In a saucepan, simmer cream with liqueur and pour it over a heatproof bowl of chocolate and let it sit for one minute, melting the chocolate underneath. 29. Stir until the mixture is smooth and of pouring consistency. If needed, liquefy with a little warm cream. 30. 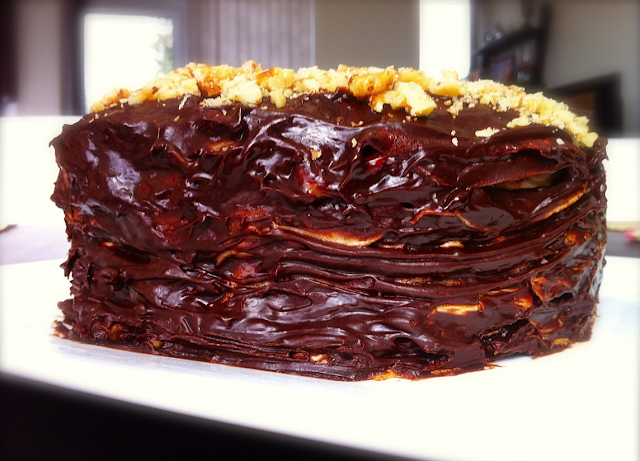 Take the crepe cake out of the fridge and pour the ganache over it. 31. To get the ganache on the side of the cake, gently ease the ganache off the sides with a spatula. 32. Sprinkle the last of the hazelnuts. 33. Place the crepe cake back into the refrigerator to let the ganache set. Then wait for all to finish with dinner before unveiling this beautiful creation. Revel in the ooohs and aaahs and sit back and let the complements pour in.